Interested? First what is a "Growth Mindset"? Thanks to Dr Carol Dweck’s research (Stanford University, professor of Psychology) there has been a shift happening in how leaning and intelligence is viewed. Dweck describes Growth Mindset as a belief system that asserts that intelligence can be developed. Parents with a growth mindset believe that their children can achieve at higher levels - with effort, perseverance, and resiliency (some describe this as “grit”). Learners (e.g. your children) with a growth mindset believe that they can grow their intelligence with hard work and learn just about anything. So, last week I talked about Redefining Failure for Kids . A google + member, Toy Veteran, commented with the quote, “To succeed you only have to double your rate of failure.” - Thomas Watson, President of IBM from the 20’s to the 50’s. I love this because it reminds us that our failures are often the most valuable and memorable teachers. We can respond to our failures by either giving up, or we can use them to become better and stronger as we try, try again (this is the perseverance and grit stuff). One is a growth mindset, the other is a fixed mindset. I know which I want for my kid (hint: it isn’t the "give up" one). While I intuitively know this about failure to be true, I still struggle with “letting” my kids fail. My head tells me it is the right thing to do, the necessary thing to do, but my heart wants to make things as easy as possible for my children, especially when you see them struggling to the point of tears. My head and heart wanted a strategy and some expert, yet practical and actionable advice. I wanted a game plan to develop grit for my kids. I found it in the form of this book: Mindsets for Parents: Strategies to Encourage Growth Mindsets in Kids by Mary Cay Ricci and Margaret Lee. Research is showing that GRIT IS THE ONE THING YOUR CHILDREN NEED TO BE SUCCESSFUL IN LIFE (life, as in over the long term). THIS BOOK tells you HOW you can instill this mindset in your child and thereby give them the biggest GIFT they will probably ever receive….THE ABILITY TO DETERMINE THEIR OWN SUCCESS. The book isn’t very long, and it is organized extremely well. It begins by breaking down for you what Growth Mindset is and what a Fixed Mindset is, why it’s important and the research that backs those claims up. In theory it sounds great, right? Let's address the elephant in the room. What about the fact that there are some people who definitely are born with more raw talent in some things than others? Einstein, Michael Jordan, Mozart - I wasn’t born with their brain, sport or musical talent. However, here are some other names: Oprah - fired from her News Anchor job because she didn’t have the talent for TV. Jerry Rice from the 49ers, went to a divisions III football school yet went on to become one of the greatest wide receivers ever. Thomas Edison's teachers said he was "too stupid to learn anything." He was fired from his first two jobs for being "non-productive." As an inventor, Edison made 1,000 unsuccessful attempts at inventing the light bulb. Think about that at night surrounded by your light bulbs (hopefully on yoru computer sharing this article with your friends). No grit, no light. I’ll go back to the original three I mentioned. They were born with skills, but they worked really hard too. There are a lot of geniuses out there who don’t have jobs, believe it or not. If it takes more than anecdotal evidence to convince you, there is gads of brain research that breaks it down to cold hard science throughout the book (but not so much I nod off). Most importantly, in my opinion, it tells you using everyday situations HOW to put what you have just learned into practice. I mean, showing me research and telling me is great, but how do I use it? For example, what do I say to my children when they want to give up or take the “easy” assignment? How can I get the spouse or grandparents on board with this growth mindset idea? (There are example conversations!) . So, you might be on board with this growth mindset idea, but how do you get your children on board with this belief that they can be better, achieve more, if they work hard and persist? Don’t despair if your child is past kindergarten. This book focuses on what to do for any age child (including college age). 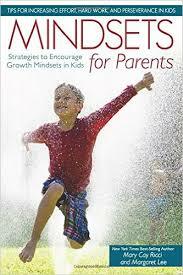 A parent mindset reflection tool. What areas do you have a growth mindset and what areas you have a fixed mindset. How to give praise, and why you should do it this way and not that way. My favorite: The Power of Yet. Instead of saying "I can’t do it", say "I can’t do it yet?” Isn’t this Yoda’s lesson?Look how far it took Luke Skywalker. The book also talks about children from toddler age through college, and includes a special section on children with special needs including a very inspiring story of a young man who overcame incredible odds with the power of a growth mindset. It is also chock full of other resources to help further a growth mindset for you and your children. Professionally, I come from a Human Resources background. The chemical company I worked for only hired the college grads that were the best of the best. Some were “born” super smart and never really had to work for their grades. The ones that struggled and reached beyond what they thought they could do were by far more successful in their careers. When I say, “successful” I just don’t mean money. I mean work enjoyment, happiness. They had a self-confidence the others didn’t because they knew what they could do, if they worked hard enough. I want that self-confidence and joy for my children for whatever they choose to work at in life. I have my own experience of fixed mindset beliefs growing up and hope to not repeat history in this regard. I grew up in a mostly fixed mindset family (all of us have a mixed bag of growth and fixed). I was the “smart" one, my sister was the “artistic” one. Even though I longed to learn how to draw and sketch and paint, I was always afraid to pick up those pencils and brushes because that wasn’t a talent I was “born” with. It wasn’t until my late 20’s that I took an art class, in Germany, where I couldn’t understand because I didn’t speak German, if the teacher was telling me I was doing it “right” or I was a miserable failure. I chose to believe that he was telling me I was doing great. That’s what "Nein, nein, nein", means right? 😉 Anyway, I learned that I could work at drawing and get pretty darn good if I chose to do that. The flip side and the dangerous side to your child's self-esteem and willingness to try to grow in the future when mindset is tied to a "fixed" trait like being the smart one, the athletic one, the artistic one, is when I wasn’t the “smart” one, when I struggled learning geometry for instance, then I felt like a total failure, an imposter because I must not be the “smart” one if I couldn’t figure this out. If I wasn’t the smart one, what was I?